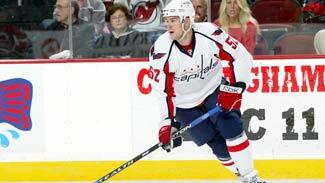 The Washington Capitals could be a step closer to seeing Mike Green return to the lineup. The defenseman skated with teammates for the first time in more than a month Friday, and afterward told reporters he no longer was experiencing concussion-like symptoms. The practice was optional and featured just 11 players, and Green did not take any contact, but according to the Washington Post, he took shots, handled the puck and skated through teammates. "That's the most I've done in a long time here," Green told the Washington Post. "I felt good, that's the most important thing. I don't have anything going on and each day's been better and it was nice to get a good skate in." It was the first time Green has skated with teammates since he last played, Feb. 25 against the New York Rangers. Green has played just twice since Feb. 6, when he was hit in the side of the head by a shot by the Pittsburgh Penguins' Brooks Orpik. He missed one game, played Feb. 12, then sat out the next five. In his first game back, Feb. 25, he was hit hard by Rangers rookie Derek Stepan and hasn't played since. Now that he's feeling better, the next step is working off the rink rust that comes with missing 22 of the last 24 games, including 16 straight. "Anytime you're off the ice and you don't use your skating muscles, it takes time to get back into the flow of things," Green said. "It only takes about four or five days to get your feel back and this is Day 1." Coach Bruce Boudreau he liked what he saw from Green, but reiterated there was no set schedule for him to return. The Capitals have four games left in the regular season, starting with a home game against the Buffalo Sabres on Saturday (7 p.m. ET, NHLN-US). "Anytime you're off the ice and you don't use your skating muscles, it takes time to get back into the flow of things. It only takes about four or five days to get your feel back and this is Day 1." Green said he'd like to get into one of those final four games, but if it doesn't happen, that's fine, also. "I think whether or not I get a game in or not," he said, "the most important is the playoffs." Green's eventual return not only will boost the Capitals because of his obvious talent -- he's a two-time Norris Trophy finalist who has 8 goals and 24 points in 49 games -- but because of a rash of injuries that have hit the blue line. Defenseman Dennis Wideman is week-to-week with a lower-body injury believed to be a serious leg injury that has him hospitalized. And in Thursday's win against the Blue Jackets, John Erskine was injured in a first-period fight, leaving the Caps with just five defensemen. However, Boudreau said he under no circumstances would he rush Green back to the lineup. "You want him to come back but you're fighting yourself because you have to do the right thing," Boudreau said. "When he's ready he'll come back and not before, no matter what happens."